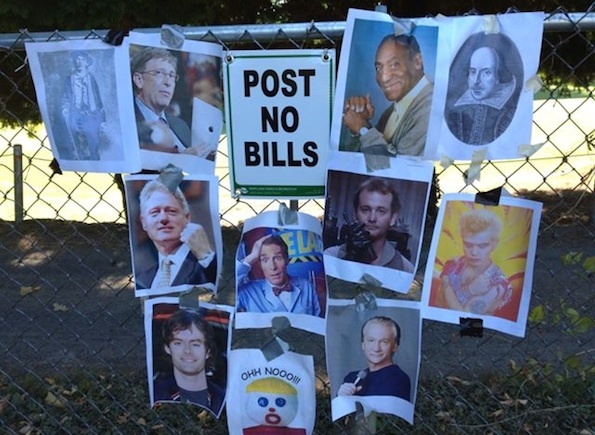 Some special soul in my native Portland, OR provided this daily haha in the form of a “Post No Bills” sign surrounded by pictures of famous dudes named Bill across from Reed College. Here we see Nye, Hader, Maher, Idol, Clinton, Gates, Shakespeare, Cosby, Mr. Bill, and Murray, but no Shatner, as one commenter noticed after George Takei shared the photo. ‘Bills’ simply means flyers and paper advertisements, hope that helped! It’s common to find this sign on derelict buildings and boarded up places. May the good people of Portland not be known just for Portlandia and riding on contraptions that technically qualify as bicycles in the rain with a microbrew hidden in their beards, but for their sense of humor.